As a low profile ambient and direct lighting source, recessed lighting does its job so well that its praises too often go unsung. 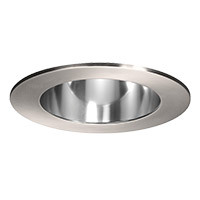 The majority of recessed light fixtures, as the name suggests, are recessed inside of a ceiling with an internal downlight fixed or adjustable for the perfect orientation of bright light. The variety of available recessed light housings and decorative recessed light trims give can lights nearly infinite installation versatility. 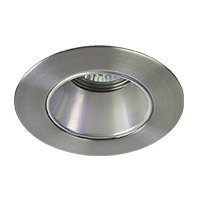 These high hat lights are suitable for new construction or remodels, for insulated (IC) or non-insulated ceiling (non-IC), are available in line voltage or low voltage and come in a wide range of lamping options (LED, halogen, fluorescent and incandescent). 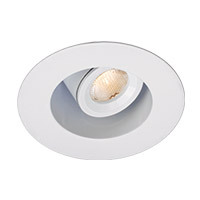 Recessed ceiling lights are the ideal choice for rooms where ceiling space is limited, be it indoors or out. In kitchens, recessed lights provide direct downlight for tasks and are usually bright enough to create useful generalized ambient light in the process. The slim dimensions of a recessed ceiling light makes it ideal for hallway lighting that can pair well with existing sconces or step lights. The dining room benefits from can lights as a mood-enhancing layer of ambient light that complements your dining room chandelier or pendant lamps. And in the bathroom, you'll find wet and damp rated recessed light trims to be the best option for shower lighting, contributing to the overall light in a space where proper illumination is of utmost importance. Likewise, use wet and damp rated outdoor recessed lights to give your porch or patio a bit of added illumination and flair. Finally, use a pair of eyelid recessed lights to highlight artwork and family photos in the living room. 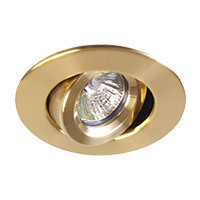 We're confident you'll find a home for recessed lights just about anywhere in yours. A style of trim with large grooves that absorbs excess light and reduces glare. Baffles are typically available in black (which reduces the most glare) and white (which reduces the appearance of holes in the ceiling). A style of trim with a mirrored surface that reflects the light to make the most of its illumination. Reflector trims can be metallic, black or white with a polished interior. A style of trim that allows control of the direction of light with a pivot inside the housing. In some cases, the light can be blocked by the housing itself, allowing for unique displays of illumination. 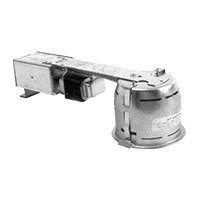 A style of trim that allows for full control of the direction of light with an adjustable pivot inside of the housing. 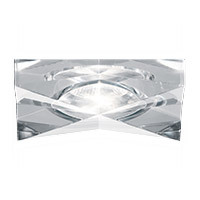 With eyeball or eyelid trims, the light extends beyond the housing to allow for complete pivoting. A style of trim that is wet-rated and intentionally designed to be used where water will be present (i.e., bathrooms). Although primarily a functional type of ceiling lighting, recessed light fixtures can also lend themselves to the overall interior design of a space. 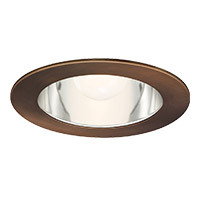 Recessed can lights are offered in a number of styles and finishes to best accommodate your room. For a contemporary space, you'll love the trims and housings in the collection from Element (from Tech Lighting) and WAC Lighting. With Element or WAC, you'll enjoy clean lines and a well-designed modern aesthetic. Juno Lighting offers trims and housings for any type of home, be it one that follows a traditional aesthetic or is approaching a modern look. With soft finishes and easy-to-use styles, Juno is a safe bet for your home. And Fabbian has a variety of decorative trims that will cause your home's guests to stare up at the ceiling, including luxury crystal options and stunning glass designs. Finally, if you enjoy the benefits of energy efficiency in your home's lighting arrangement, check out the assortment of LED recessed lighting from Contrast. As a long-time brand for recessed trims and housings, Contrast has a solution for just about any lighting need. Low profile recessed lighting is available in multiple sizes and there are two essential parts that you need to have for complete fixtures: recessed housings to power the light from within the ceiling and recessed trims, the decorative part of the fixture that is visible on the base of the ceiling. There are several considerations for both housings and trims, and you'll need both to use recessed lighting in your home. Housings are offered for remodeled homes or for new construction homes. Depending on the year your home was constructed and how the fixture will be installed in the ceiling, your choices will vary. 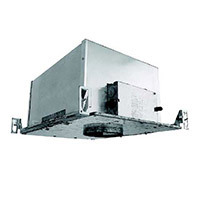 You will also find housings are offered for insulated ceilings (noted as IC Rated) and ceilings without insulation (Non-IC Rate). For safety reasons, you must choose the appropriate housing for your home's construction. Be sure you fully understand your home's ceiling construction and presence of insulation before purchasing the housings you think you need. Or, you may wish to consult with an electrician to make the best choice. Likewise, trims are available in many options as well. From colors, finishes and features to a range of sizes spanning from 2" to 6", you have a lot of choices to set up your ideal recessed lighting system. Thoroughly measure the space on the ceiling where you plan to install new trims to get the best idea of the sizes you can work with. As a general rule of thumb, divide the ceiling in three to understand the sizes and number of fixtures you'll need to adequately bathe room with light. If you're opting for an understated look, choose trims that install parallel to the base of the ceiling. Conversely, for something meant to shine on the ceiling, look to fixtures that slightly extend from the base of the ceiling. Another important consideration is the type of bulb that is used in the fixture. While some recessed lights use energy-efficient LED light sources, you'll notice options for halogen, fluorescent and incandescent as well. Depending on your lighting needs and the amount of light output you prefer for a given room, your choices will vary. Be sure to pair the light source of your choosing with the appropriate housing as well. And if you need bulbs for a recessed fixture or simply need replacement bulbs, be sure to find the appropriate one in the light bulb category. 4. What About Recessed Lighting Near Water? 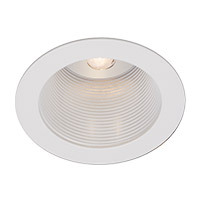 A wet or damp-rated recessed light fixture is one that can be installed in spaces where the presence of water is inevitable. These water-safe lights are best used in the bathroom where they will not be affected by condensation or occasional exposure to water. Consider installing recessed trims in the ceiling above your bath or shower, where they will provide ample light while being safe and out of the way. You may also choose wet or damp-rated can lights for exterior spaces too like the porch, patio or a covered gazebo. Although in-ceiling lighting with a directional eyelid is great for highlighting paintings and art, you may prefer a wall-mounted picture light instead. Picture lights provide the same directed and focused light output you need for display lighting, but they are mounted to the wall rather than the inside of the ceiling. Set the mood in your dining room or living room by putting your can lights on a dimmer control. Dimmer switches are easy to install, work with almost all recessed light systems and you'll enjoy the ability to control light output at a moment's notice. Lastly, find another layer of accent lighting for the kitchen by installing counter lights.